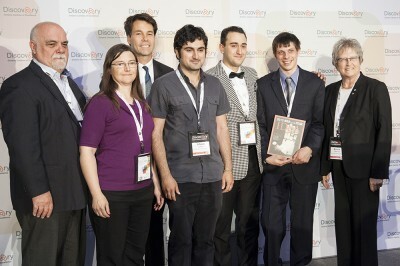 2013 IDeA winners from Carleton accept the 1st place award. In this photo are: Alfred Spencer – Director, Accessibility Directorate of Ontario, Dr. Eric Hoskins – Minister of Economic Development, Trade and Employment and Bonnie Patterson – President and CEO of the Council of Ontario Universities. Carleton students are: Alborz Erfani, Natalie Levasseur, Alim Baytekin and Tim Inglis. The Council of Ontario Universities in partnership with the Accessibility Directorate of Ontario introduced the IDeA Contest in 2012 to encourage undergraduate students from across the province to come up with innovative and cost effective ideas to remove barriers for persons with disabilities. In last year’s inaugural contest, four Carleton projects were selected as finalists and the top two prizes were won by Carleton students. This year, 18 of Ontario’s 21 universities submitted entries, and once again Carleton students led the way, placing 5 projects in the top 9 finalists and capturing all of the top three awards. Congratulations to our students and their advisors for demonstrating Carleton’s singular leadership in the field of accessibility.